If you’re about to move into your first-ever apartment, congratulations! Now you probably don’t have all the furniture and supplies you’ll eventually need. However, you can get by for a while on the bare minimum, so your friends at Rent.com have developed this first apartment checklist featuring apartment must-haves. Bed (or mattress if you really can’t afford the frame just yet … or air mattress if you’re really strapped for cash): While mattresses can get expensive, you should really consider making the investment. You’ll use it every night and no one likes to sleep in an uncomfortable bed. Bedding: This includes sheets, blankets, a comforter and pillows. If you’re looking to save money, look for a set that includes everything rather than buying each piece separately. You can also save by purchasing a discount store like Ross. Lamps: While your apartment likely has ceiling lights, having a lamp for extra illumination is key. Alarm clock: Just in case your cell phone battery dies overnight. You don’t want to be late for work! Even if you’re not an aspiring home chef, there are a few things you’ll need in your apartment kitchen right away. Trash bags: Because no one wants piles of trash in their apartment. Dish soap: Washing dishes isn’t fun—but it’s definitely a necessity. Pans: Ordering in and going out on a daily basis can do a number on your bank account. Buy a simple set of pans so you can cook at home. Spatula: In addition to pans, you’ll need this to cook. Silverware: To eat with (even if it’s off of paper plate). Knives: To cut things with. Cutting board: To cut things on. Coffeemaker (if you rely on a cup of joe to get up, that is): The cost of getting coffee at a shop every day will quickly add up. If you need a morning jolt, a coffee maker will quickly make up for the initial cost. You’re just not going to feel at home without these bathroom necessities. Toothbrush: Hopefully you already have one of these and use it multiple times every day. Toothpaste: Also something you should already have and be using regularly. Hand soap: Sanitation is important. Toilet paper: Umm … you know why you need this. Towels: That shower just won’t be as satisfying if you have to air dry. Couch: This is pretty self-explanatory. It’s where you’ll be sleeping until the new bed you order comes in. Television: If you’re going for a new device, it’s better to have the best of the best. Nowadays, even the bells-and-whistles don’t cost very much. You can get a 55-inch 4K TV for under $500! Internet/Cable: Even if you cut the cord, you still need the pipes for the internet. Make sure you have your internet provider ready to go before your move, so you’re not scrambling for WiFi hot spots to post pics of your new crib online. Coffee Table: This one isn’t so much a necessity as it is a nice flourish to have. It also doubles as a workspace on your remote work days. 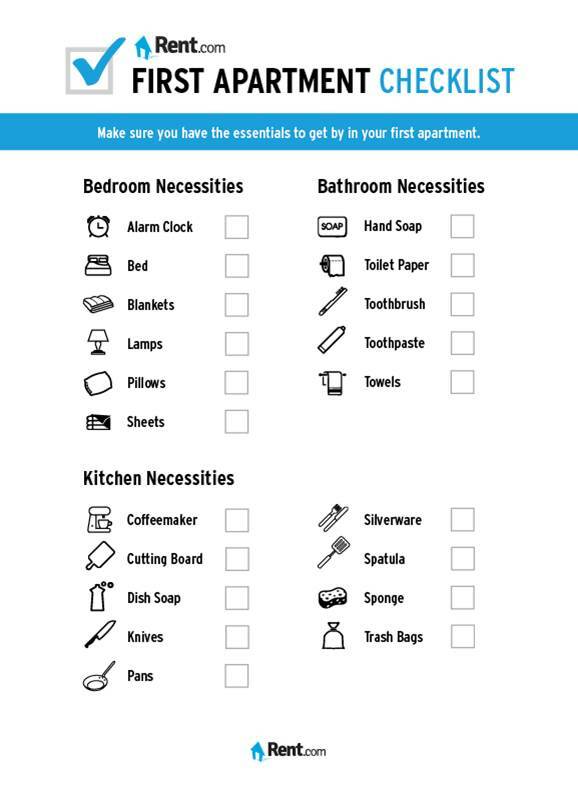 As you settle into your new home, there are plenty of other things you need, but this apartment checklist is a great start.